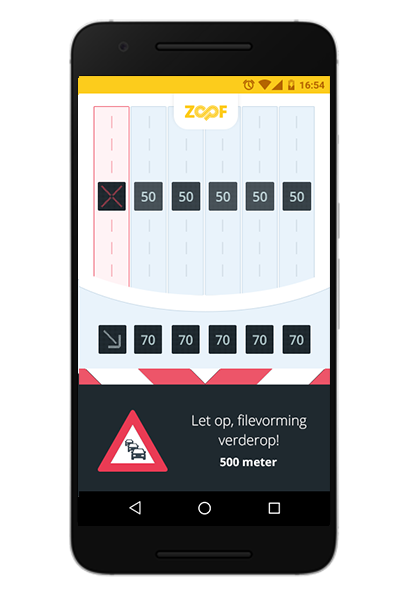 ZOOF is the app for iPhone and Android phones that gives you as a road user advises about the optimal driving speed, at insertion strip(s) and exitstrip(s) and about follow distance to the car in front of you. By obtaining these advice you can earn points (ZOOFies), you can redeem for nice rewards with the partners of ZOOF. Currently, ZOOF can be used on the A58 and A67, from Tilburg to Eindhoven and Venlo in The Netherlands. 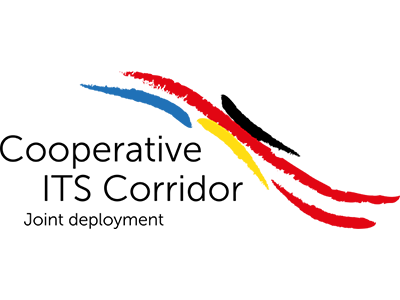 ZOOF is a product that has been originated between the regional government BBZOB (Better Benutten Zuid Oost Brabant), SRE (Samenwerkingsverband Regio Eindhoven), the Province of Noord-Brabant and V-tron. Together, the government and the business community are going to improve flow on the Dutch motorways. 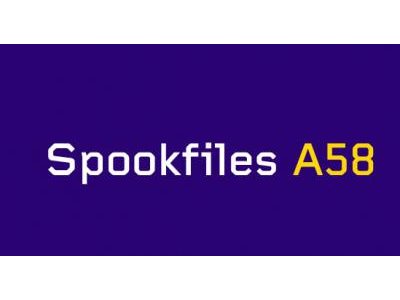 Within the projects Brabant InCar III and Spookfiles A58, ZOOF carries out tests on the A58 on behalf of the government and A67 will focus on improving the flow of traffic. You can these do these tests by yourself! ZOOF can be downloaded from the Google Play Store and Apple AppStore. Register via the app, start the route and score ZOOFies! More information about this project can be found on the ZOOF website. 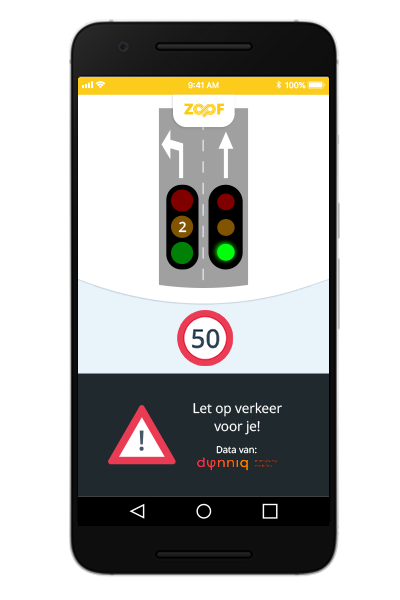 ZOOF C-ITS (Cooperative-Intelligent Transport Systems) is the app that you as a road user advises about the optimal driving speed, lane availability and possible dangers on the road.The ZOOF C – ITS app is still in the development phase. The app has been extensively tested on the A16 between Rotterdam and Dordrecht and on the bypass of Reims in France. This as part of the European Intercor project. With ZOOF C-ITS, there is a WiFi-P G5 connection set up between the roadside and the passing vehicles via an OBU (on board unit) of V-tron. In this way, a personal advice is given about the situation that applies at that time on the road That is ” drive smart together ”. ZOOF C-ITS is a product that is a spin-off from the projectSpookFiles A58 and is further developed in this formby GetHooked and V-tron. More information about this project can be found on the website of SpookfilesA58. Do you often drive on the A16? And would you like to drive around in your car with innovative techniques? Request the BETA version of the ZOOF C-ITS App via the link below. 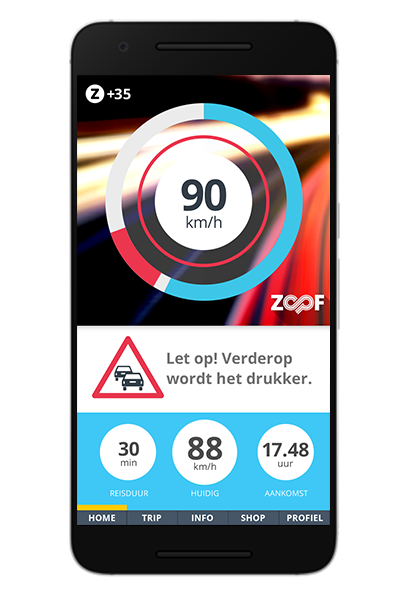 ZOOF GLOSA (Green Light Optimized Speed ​​Advice) is the app that advises you as a road user in the city center on the optimal driving speed, lane availability and possible dangers on the road and time to green. This version of ZOOF is still in the development phase. The app has been extensively tested by V-tron in the city center of Helmond during the Pre-Test-Fest GLOSA in June 2018. Further tests are carried out by V-tron in collaboration with the ITS corridor project team in England at the Test-Fest Glosa in October 2018. 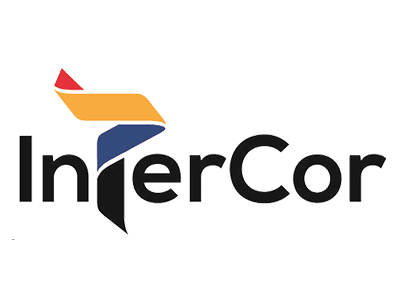 This as part of the European Intercor project. With ZOOF GLOSA, a connection is established via an OBU (on board unit) with WiFi-P G5 and the 4G / LTE network that communicates with the iVRis (intelligent traffic control systems) along the road and passing vehicles. In this way, personal advice is given about the current situation, as the traffic light turns green in 5 seconds. That is ” drive smart together ”. ZOOF GLOSA is a product that originates from the European Intercor project. In this way Europe is connected to each other via ITS. More information about this project can be found on the Intercor website. ZOOF is, as mentioned above, in the development phase. At this moment, ZOOF consists of three separate services. These services are available at various locations throughout Europe. In the coming months, ZOOF will be further developed and merged into a single service that supports you as a road user. In this way, V-tron C-ITS makes services accessible to you. That is ZOOF: drive smart together.